A warm welcome awaits you at the Dresden. Ideally located in the midst of Teignmouth town centre, with all local amenities just a few minutes walk away. Visit Dawlish Devon and the surrounding villages and stay in bandb, hotel or vacation rental accommodation provided by BedPosts members. Dawlish is a seaside resort two miles south of the long sandy tract at the mouth of the River Exe. A stream ripples quietly through the town. Sandy beach, good bathing, and picturesque red cliffs. Read about the surrounding area and maybe stay outside Dawlish in a nearby village or hamlet in a b and b or holiday home accommodation. Dawlish is a pleasant town located between the estuaries of the River Teign and the River Exe. Its architecture is partly Regency, partly Victorian. The town became a resort late in the 18th century. A picturesque feature is the Lawn, a landscape garden with a stream noted for its black and white swans. The Strand, a street created in the early 1800's still keeps its elegant Regency character. Dawlish was a favourite of Jane Austen, and Dickens made it the birthplace of Nicholas Nickleby. The railway here - the main line to Penzance - is unusual in that it runs along the sea-front. Dawlish's bright red cliffs are well known, and to the north extend the broad beaches and sand dunes of Dawlish Warren. After reading about the historical places to visit you might want to extend your stay in a Dawlish B&B, hotel or inn. The town is named after the stream, which is a Celtic river-name meaning “dark stream”. 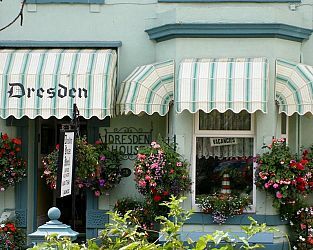 If you seek accommodation near Dawlish in Devon you have come to the website of a “club” of providers who offer affordable quality accommodation around UK in hotels, bed and breakfasts, guesthouses, inns, and restaurants plus self-catering cottages and apartments .